This is a poster created to commemorate the great defense of Brest, performed by Soviet soldiers in 1941. The poster shows a soldier holding a RPG-40 antitank grenade ready to make a throw. 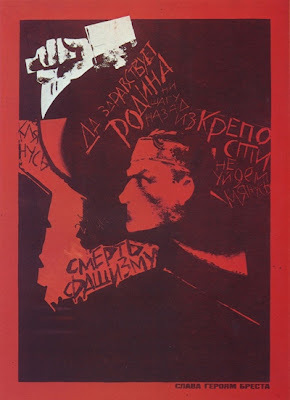 The contrast red and black image along with the slogans form the Red Star. The slogans go clockwise starting from 9 o’clock: “I swear”, “Viva Motherland”, “No step backward”, “Never retreat from the fortress” and finally “Death to fascism”. Brest Fortress was actually attacked two times – in 1939, being a Polish fortress, it was assaulted by German general Guderian, who according to the secret protocols of Molotov-Ribbentrop pact signed by Nazi Germany and Soviet Union was partitioning Poland. Later that year, Brest Fortress was given to Soviet Union according to that pact. On June 22, 1941 the fortress and the city of Brest was attacked by Nazi Germany at the beginning of the surprise war – this was its second and the most famous siege. According to Operation Barbarossa (blitzkrieg or flash war) Brest Fortress was to be taken by 12 o’clock the first day the war broke out. But German generals, who had been planning the operation, certainly underestimated the devotion of Russian soldiers, who managed to defend the fortress for almost a whole month – surrounded and not knowing that the front line had been moved hundreds of kilometers deep into the Soviet territory. Finally, the defendants perished, and became one of the icons of Soviet WW2 Heroic Propaganda. Upon getting into the demolished fortress Nazis found writing on the part of the wall which said: “I die but never surrender. Farwell, Motherland. 20th of July, 1941”. Check the beautiful fortress images at allposters!